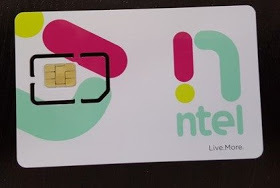 The ntel 4G LTE finally hits Abuja and Lagos, Nigeria and it would take some couple of months before Ntel 4G LTE reaches some other states in Nigeria. The internet access speed is amazing, those who purchased their sim card earlier can testify to it, up to 55.13Mbps on downloads and 24.40Mbps for uploads. • Scroll down and click on "choose your own number"Next, fill in the important information in the field provided and once your number is ready, you’ll be contacted to pick up your personalized number. However, the available pickup states are Abuja, Lagos and Port Harcourt. Below are the list of their data plans, tariff plans and prices, along with compatible smartphones. 1. ntel Smartphone starter, offers unlimited data access, unlimited SMS with 30mins voice call which is valid for 3days. This offer goes for just N1,000. 2. ntel Standard plan, offers unlimited data access, unlimited SMS with 70mins voice call which is valid for 7days. This offer goes for just N2,400. 3. ntel Monthly plan, offers unlimited data access, unlimited SMS with 300mins voice call which is valid for 30days. This offer goes for just N9,000. Compatible smartphones include TecnoBoom J8, Tecno C5, Samsung Galaxy S6 Edge, Konka L5 70S(R1)(R2)(E1), Phantom 5, Infinix Zero 3 and Infinix Note 2 (2GB Ram version). Since the listed smartphones are 4G LTE enabled smartphones, I can assume that their plans will be compatible with every 4G LTE enabled smart phones. Fair usage policy now attached to their unlimited data access, this is due to the fact that most individuals are likely to use their unlimited data access for commercial purpose. According to ntel, “customers likely to be affected by this policy are those who generate large volumes of traffic; often have file-sharing software or peer-to-peer/torrent apps on their phones or tablets; and download large-format files such as music, videos and movies consistently”. However, it’s also noted that any customer who uses above 3GB data daily would be slowed down to 512bps, if done continuously might get disconnected or blocked. If you have already purchased their sim card and tested their network, share on the comment box about ntel services. Share this post on Facebook, Twitter, whatsapp and Google plus.